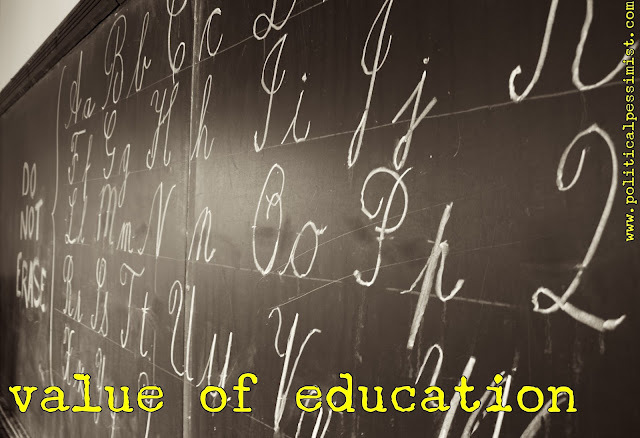 This post is the final part in a series of three posts on school choice focusing on value: the value in true bi-partisan support of an issue, the inherent value in choice, and the ultimate value in education. Read part 1 and part 2 now. I could go on. It seems today that the point of education, the ultimate value people place in it, resides in a little piece of over-priced paper. Even the conservatives who decry the college and university system and its obvious indoctrination of generation after generation into authoritarian and socialist “values” discount you, your experience, and your value if you choose to not spend four (or more) years post-high school getting indoctrinated. What? Is that really what we’ve come to—vesting the ultimate value of education in a piece of paper, one that puts kids into significant debt and generally offers no real value to their ability to work (underwater basket weaving, anyone? gender studies? new age mysticism?)? Do we really trust these entities to churn out responsible, reliable, good citizens after 12 years in failing public schools? Or worse—trust them to not undo 12 years of good work in other school options? The cognitive dissonance is astounding. The lack of logic is alarming. Therefore, send your kids to at least 4 years of college! Just as when “everyone is special, no one is,” the fact that everyone has college degrees now means no one is special (and college degrees are worth significantly less). Let’s be honest. College, currently, is nothing more than extremely expensive high school, part 2. But this article isn’t about college. The point, rather, is what is the real value of education. Is the value of education really only to be found in a college degree? No. The real value of education isn’t even in “reading, writing, and arithmetic.” No. The real value of education is in creating active and engaged citizens. The real value of education is in learning reality, not bias—and how to distinguish between them. The real value of education is… wait for it… values, not a piece of paper. Rather than putting ultimate value in what is increasingly becoming a worthless piece of paper, why don’t we reset and refocus the foundation of education back to what it should be: creating and instilling lifelong skills rooted in values. Before you can create even basic knowledge, foundational values are necessary. When we have presidential candidates saying things like, “If you don’t have a college degree, you won’t amount to anything in life,” it’s no wonder this nation is in the mess it is. Oh yes, did I mention I was told that by a candidate for the Republican nomination for President in 2016? It’s a systemic problem. It’s far beyond time we re-evaluate the value of, and values in, education if we truly want to make a difference. Hi there Sarah, you seem to be stirring the pot as always. I have been a long proponent of the idea you profess, "not everyone needs a college degree." I do, however, have a caveat to your theory. If someone doesn't have the maturity or the intellectual potential to: critically think for themselves, question, communicate their thoughts and questions, or find their own answers. Do they not deserve to better their life? What about those who want a good job but whose intellectual wells run much more shallow than the lofty goals you propose? Technical schools with two year accreditations are the answer to both problems. People can have that happy piece of paper while also learning a marketable skill. The fact you escape is, while you personally have the drive to better yourself without the need of an impending deadline, not everyone is like you. The reason autodidact is a special word describing people like us, is because most people do not share this ability. Technical schools are the stopgap solution to the problem of not having the credentials (or skills) to get a job you want, while not wasting time and money instilling philosophical ideas which an underwater basket weaver probably doesn't even understand. This also presents another solution to the student debt problem. Jobs needing technical schools pairing up and funding students schooling in return for short term contracts using those skills. These programs already exist and should be societally exalted over the "need" for everyone to achieve that four year degree. Me? Stirring the pot? I might resemble that remark *just* a little. I appreciate your comments, and really like your point about technical schools. I would argue that, except in cases of pretty severe learning disabilities, most can attain at least some level of thinking, questioning, and communicating, but maybe not everyone *wants* to do that, and that's also fair.